Arrive at Islamabad International Airport. Meet, assist & transfer to the hotel. AM at leisure. PM Islamabad city tour. Our sightseeing tour will start from, Faisal Mosque, Shakar Parian & National monument with a trip to Damn-e-Koh, to catch an eye bird view of the twin cities. Overnight at the hotel in Rawalpindi/Islamabad. (No meals). After breakfast drive to Chilas. Chilas was on the ancient caravan track over the Babusar Pass into India and on the Indus trail of Besham, and many rock engravings / impressions were left by travelers in this area. Chilas is standing under the shadow of world famous Killer Mountain Nanga Parbat. Upon arrival transfer to the hotel. Overnight at the hotel. (Breakfast only). After breakfast drive up to Raikot Bridge then 4×4 Willy jeeps drive up to Tato & Trek to Fairy Meadows. The sharp and difficult slope on a rocky track will lead us to a small settlement of Tato which is comprised of a small number of soil lofts scattered around. This village is colonized by the straight and fierce yet but very hospitable. 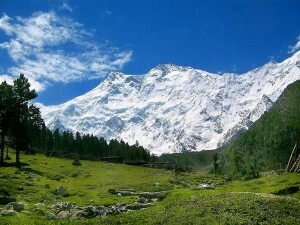 The established base camp of Nanga Parbat, known as Fairy Meadows. The local people think that this stunning place is a residence of fairies and ghosts. The lush green plateau presents some of the most spectacular sights one can ever witness. Overnight in Huts/Tents. (Breakfast, Lunch & Dinner). 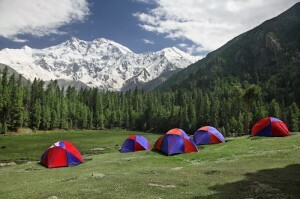 Full Day Leisure at Fairy Meadows Overnight in Huts/Tents. (Breakfast, Lunch & Dinner). After breakfast proceed to Nanga Parbat base camp excursion. This huge mountain is not a single peak but a series of ridges culminating in an ice crest 8,125 meters high – ranked ninth highest in the world and second in Pakistan after K-2. Early disasters on Nanga Parbat gave it the nick name Killer Mountain or Mangeur D ‘Homme. Twelve climbers and 18 sherpas had died there by 1937. The monster was finally conquered in 1953 by the German Expedition. Overnight in Huts/Tents. (Breakfast, Lunch & Dinner). Breakfast in the Tents. Drive down to Raikot Bridge and further drive to Minapin. It will take about 8-9 hours. Minapin is a small Village of Nagar Valley, which is the gate way to the beautiful mountain Rakaposhi and beautiful Diran Peak. In the Village we have got both options of stay either in the tents or in the Hotel. We shall arrange our all food and camping material as we shall be starting our trek from this Village. Overnight at the hotel/Guest House. (Breakfast only). After breakfast start trek to Tagha Phari. It will take 7 to 8 hours to reach Tagha Phari, once we reached there we shall be in the shade of mighty Rakaposhi (7788m) and Diran (7266) peaks. Rakaposhi (7788m) is one of the most eye-catching peaks known as Beauty Queen and the world’s 29th highest mountain. One can observe from the Karakuram Highway while going to Hunza from Gilgit. The peak is encircled by well-known glaciers and valleys like Bagrot, Minapin and Jaglot. Overnight in Tents. (Breakfast, Lunch & Dinner). After breakfast Full day excursion to Diran Base Camp. Overnight in the tents. (Breakfast, Lunch & Dinner). After breakfast in front of Rakaposhi and Diran we shall proceed down to Minapin Village and further drive to Karimabad. Upon arrival transfer to the hotel, PM at Leisure. Overnight at the hotel. (Breakfast only). After breakfast full day city tour of Hunza including Baltit Fort. Karimabad is the delightful old capital of the Hunza Kingdom. 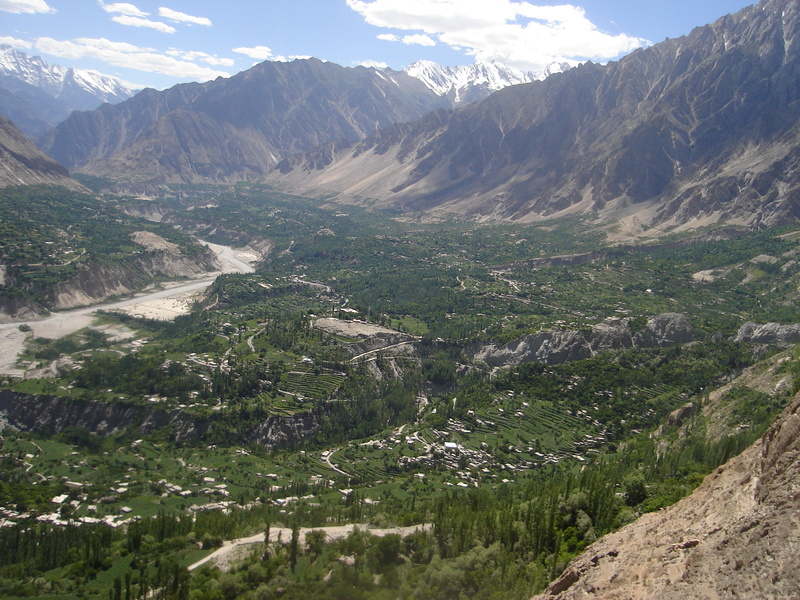 From Karimabad, with its souvenir shop, post office and tea shop, you can obtain a magnificent view of the valley laid out below you and of the peaks behind. The Aliabad / Karimabad area is scattered with wild flowers and blossoming fruit orchards. We will spend half our day in these two towns enjoying the greenery and delighting in the sound of water falls. Overnight at the hotel. (Breakfast only). After breakfast walk up to Ultar Meadows. A good day hike can be made to Ultar Meadow, which is at an altitude of about 3,000 meters, behind Karimabad. The Ultar Meadow is used as a summer pasture by the Baltit villagers. After coming down to Karimabad we shall visit the Old Baltit fort was the old palace of the Mirs of Hunza and was inhabited until 1960. It is about 400 years old. Baltit is a curious rambling old place, sturdily built of stones, sun – dried mud and timber. Baltit Fort is built on a cliff edge; behind it is a ravine and then the Ultar glacier glinting in the sunshine. The architecture here reflects a Tibetan influence. The view from the top of the fort is well worth the climb. After Fort we shall have good time in Karimabad bazaar. Overnight at the hotel. (Breakfast only). After Breakfast proceed to Attabad Lake excursion. which is a full day trip from Karimabad. We’ll enjoy the Lake through friendship tunnels. (Crossing the lake by motor boat is optional activity). We shall visit Gulmit village to explore local area (Gulmit is the summer capital of Hunza Valley). Cross the Lake by motor boats up to spillway of the Lake. On return from Gulmit drive back to Karimabad by Willy Jeeps. Overnight at the hotel. (Breakfast only). Breakfast at the hotel. AM. At leisure morning while exploring the area, afternoon we shall drive to Gilgit. Upon arrival transfer to hotel, and proceed for Gilgit Bazaar excursion, suspension bridge. Gilgit is the administrative center and economic hub of Gilgit/Baltistan. 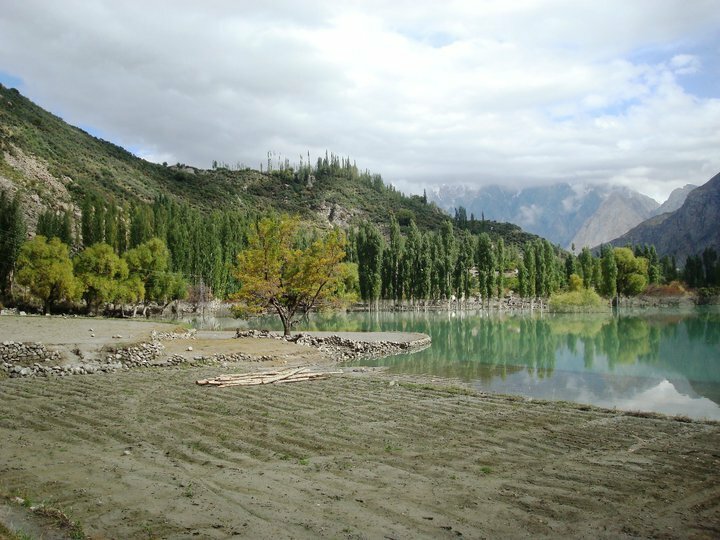 It lies in the heart of the Karakuram, at 1500 metres, near the confluence of the Hunza and Gilgit Rivers. The bazaar is modernizing, from shacks to two storey cement shops, NLI Market with a selection of Pakistani, Chinese and European goods. Well worth taking home are Chinese silk, and saffron, worth its weight in gold! Gilgit is home to many freestyle polo teams, and if you are in town during a tournament you are in for an exciting afternoon of traditional music, non-stop play and free style polo match. Overnight at the hotel. (Breakfast only). After breakfast transfer to Gilgit airport for flight to Islamabad by PK-606 or PK-608 (Subject to weather flight). Transfer to the hotel. Overnight at the hotel in Rawalpindi/Islamabad. or PM at leisure in Islamabad/Rawalpindi. (Breakfast only). (If flight cancels then, we will drive via Karakuram Highway to reach Islamabad on the way overnight stay in Besham). Upon arrival transfer to the hotel. or Next day drive to Islamabad. (Breakfast only). NOTE:- Confirmation of flight to/from Gilgit is subject to weather on provisional bookings and confirmation of seat is expected one day before. Confirmation depends on previous backlog. After breakfast drive to Islamabad via Taxila.Overnight at the hotel. 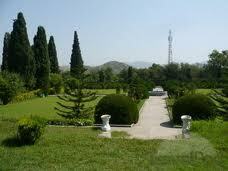 Or Proceed to Taxila for day excursion. Overnight stay at the hotel in Rawalpindi/Islamabad. (Breakfast only).